Kennt Ihr eine Frau mit einem geilen Schlitten, die ein Iglu bauen kann? Vor ein paar Tagen war ich nämlich zu einem tollen Event eingeladen. Los ging es damit, dass die Gruppe sich in Oberstdorf mit der Nebelhornbahn zur Station Höfatsblick bringen ließ. Schon alleine die Fahrt mit der Gondel war atemberaubend, denn die Bergwelt zeigte sich bei strahlendem Sonnenschein und knallblauem Himmel von ihrer schönsten Seite. Einigen Teilnehmern rutschte zwar fast schon hörbar stets aufs Neue das Herz in die Hose, wenn wir mit der Gondel einen Pfeiler passierten, denn dies erzeuge jedes Mal einen mächtigen, durchaus Angst einflößenden, Ruck in der Gondel. Wir erreichten jedoch gesund und munter unser Ziel und vernahmen dort staunend das Programm, das für uns geplant war. Uns wurde nämlich mitgeteilt, dass wir zu einem Iglu-Dorf wandern, unser Mittagessen dort in einem Iglu einnehmen würden, um daran anschließend höchst selbst ein Iglu zu bauen! Zurück zum Tal wurde die Fahrt mit einem Schlitten angekündigt, was für mich persönlich noch am meisten Wiedererkennungswert mit bekannten Unternehmungen hatte. Entsprechend gespannt traten wir in das Iglu ein, das als Restaurant diente, und nahmen darin auf kuscheligen Fellen Platz. Das Iglu war viel größer als in meinen Vorstellungen und unter beeindruckenden Skulpturen und bunten Lichtern, die durch Schnee und Eis schimmerten, wurde uns ein schmackhaftes Käsefondue serviert. So gestärkt wurden wir in den Iglu-Bau eingewiesen, und auch wenn ich es mir selber niemals zugetraut hätte, schufen unseren Gruppen in wenig mehr als einer Stunde einige Iglus, in denen man sogar die Nacht hätte verbringen können. Ehrlich gesagt war ich froh, dass dieser Punkt nicht in unserem Programm enthalten war, denn ich kann mir wärmere Nächte als in einem Iglu aus Eis und Schnee ausmalen. Nicht nur deswegen rodelte ich gerne plangemäß mit dem Schlitten ins Tal zurück und hatte auch dabei enorm viel Spaß, dass ich mich direkt – ja, wie eine Frau auf einem geilen Schlitten fühlte. Heil und leider zu schnell kam ich unten an, stieg glücklich vom Schlitten und freute mich von Herzen über den grandiosen Tag, der hinter mir lag. Von dem her kann ich jedem, der eine richtige Gaudi haben möchte, nicht nur den Bau eines Iglus, sondern auch eine Fahrt mit einem geilen Schlitten von Herzen empfehlen. Wie geht es Euch beim Fahren mit der Gondel? Habt Ihr schon mal ein Iglu gebaut? Rodelt Ihr gerne? Do you know a woman with an awesome sleigh who is able to build an igloo? A few days ago I was invited to an extraordinary event. 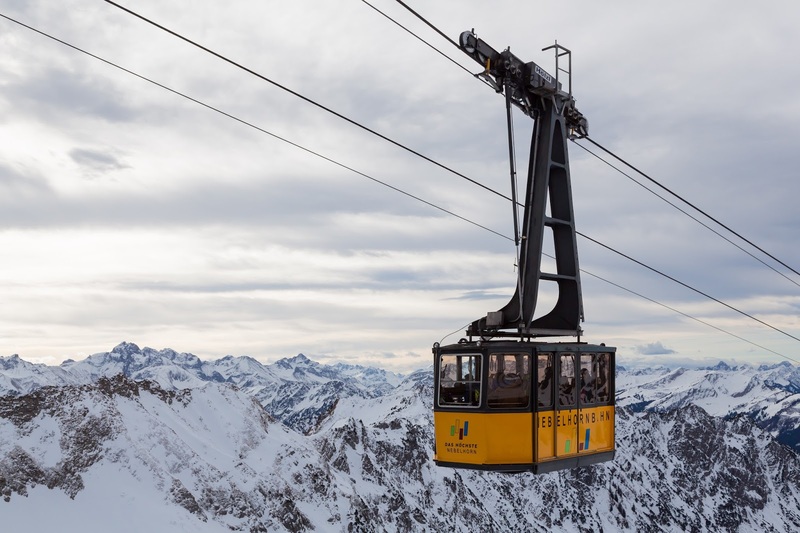 We started with a ride in Oberstdorf with a cable car of the “Nebelhornbahn”. Already the ride was stunning, because the mountains appeared in glorious sunshine and bright blue sky at their best side. Although some participants nearly the heart sank in their boots during the ride with the cable car we reached our destination safe and sound and heard in disbelief the program that had been planned for us. Because we were told that we would hike to an igloo village and have lunch there in a igloo restaurant and afterwards had to build an igloo by ourselves! Back to the valley, the ride with a sleigh was announced, which for me personally was the most familiar thing in the context with the planned things. Accordingly excited we entered the igloo which has the function as restaurant, and took place on the snuggly furs. The restaurant igloo was a lot bigger than I imagined and we enjoyed a tasty cheese fondue under impressive sculptures and colorful lights, which shone through the snow and ice. Thus strengthened we were sent to the igloo building and although I would never have dared to do this without the encouragement we got, our groups built in little more than an hour a few igloos, in which one could even spend a night. Frankly, I was glad that this point was not included in our program, because I can honestly imagine warmer nights than in an igloo made of ice and snow. Not only due to this reason I tobogganed with the sleigh with pleasure back to the valley and had during this sleigh ride so enormously fun that I felt myself directly - yes, like a woman with an awesome sleigh. Unfortunately a little bit too quick for my taste I reached the valley, jumped happy off the sleigh and was full of gratefulness for the day I had. I would recommend to anyone who wants to have tremendous fun not only to build an igloo but also a trip on an awesome sleigh. How do you feel when you take the cable car? Have you ever built an igloo? Do love to toboggan with a sleigh? Do you know this woman with the sleigh? oh wow wishing i was on the slopes as well ! 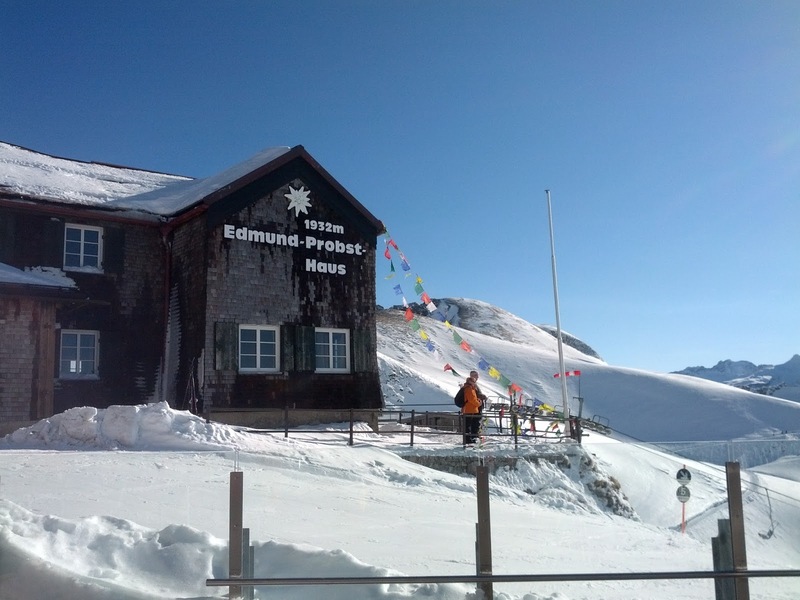 Es war wirklich traumhaft dort und auch noch wesentlich mehr Schnee als bei uns hier, wo sich der Schnee langsam aber sicher auch immer dünner macht. Amazing landscapes Rena, love so much snow. Amazing photos dear Rena! Kisses. So ein Iglu bauen ist schon eine Menge Spaß. Na ja, wir haben das früher immer eher weniger professionell im heimischen Garten gemacht. ;) Schade, dass uns der Winter schon wieder verlassen hat und es so verdammt mild ist. Daheim im Garten haben wir das auch gemacht, aber auch nicht so professionell wie uns das jetzt beigebracht wurde :) Ich denke und hoffe jetzt einfach mal, dass der Winter gerade Pause macht. I loved reading this post, Rena! Rena, this looks like such an incredible experience! Unique, fun and different! I am so jealous of your incredible worldly travels but love to see and hear about them! Keep smiling and have a wonderful weekend! Lauren, it was! I never did before something similar :) Have a wonderful weekend! Really nice post and amazing look! Lol I dont know one personally but would love to explore that idea one day! Hopefully you will have the possibility! It was really a bit unreal there :) But I loved it and for me it was also the first time in my life I saw a real igloo. Hopefully you will be able to convince your boyfriend! That igloo village seems like an amazing place to visit!!! I'm sure you really enjoyed your stay there...and that ride with the sleigh must have been fun!!! That last photo is breath-taking...what a lovely sunset. Thanks for loving my sporty look. You are right, that Armani jacket is indeed practical! So cool have fun you look fab to ski. Stunning pictures Rena! And I can see you're perfectly trendy too! ;) Love that baby blue skiing gear! ;) Have an amazing weekend! Stunning experience, you took great pics! Italy is style :) Thanks, dear Elena! Tudo fica bonito no inverno. A paisagem, as roupas, as pessoas. Minha cidade é tão quente ... quase sempre uma média de 38 graus. Oh, it is really hot in your town … honestly I like the cold and I enjoy these chilly temperatures. Many thanks for your kind words. Love the turquoise blue and the Ray Bans..cute!! Wow, Rena, this sounds like such a fun experience! I've never done any snow activities before, but I've always wanted to do snowboarding and skiing, perhaps one day I will! I would LOVE to build, well at least attempt to build, an igloo! It's also pretty cool that you dined in an igloo restaurant, too! I can't go without mentioning how fabulous you look as well in that gorgeous blue suit, only could look so fabulous in the snow! Thanks so much for sharing, my dear and beautiful friend, and I hope you have a wonderful weekend! It was fun, dear Jalisa! Hopefully your dream comes true and you will have the possibility for some activities in the snow. And yes, it was cold in the igloo but fortunately bearable :) Thanks a lot for your kind words! I hope you have a wonderful weekend! Wow, Rena, what a fabulous post! You always go the extra mile to make your blog extraordinary! YOU are so brave t do this, yet it does look like so much fun! I would have been afraid on the cable car, but how pretty to see the snow underneath! You look so chic in your snow gear, and the igloo looks so cold, but the furs did their trick, and I can see you are warm! Thank you, dear Elle! Your feedback makes me so happy! I could imagine you would have felt well in the cable car and you enjoyed only the fantastic view as such cable cars are very safe. I love snow, amazing views and funny pics!!! Cute look & great photos!! Nice look e great photos! What a fun experience! The view is really breathtaking and omg, I loved the photos inside the igloo!! It was indeed fun :) Thanks! What a great experience! Nice pictures love. What an amazing experience dear! You're so lucky to have the chance to live that! Many thanks, I’m very thankful to have the possibility for such experiences. Perfect look dear, amazing place!!!!! Hi, I'm Chiara , an Italian fashion blogger. I saw your website and I fall in love with your collections! Could you be interested to cooperate with my blog? If you need some informations or media kit, please contact me. 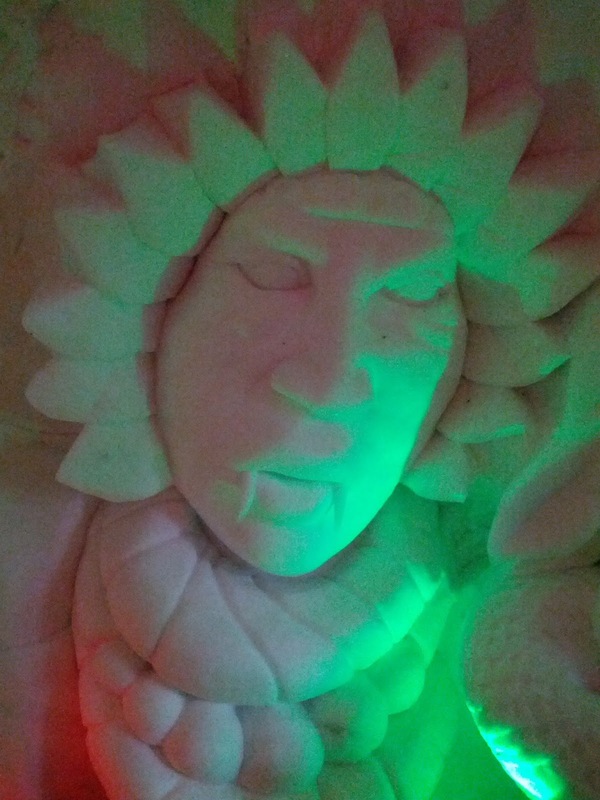 Ich hätte mir weder vorstellen können, dass man sich ein eigenes Iglu bauen, noch dass man darin gut schlafen kann. Aber nach diesem Tag weiß ich ersteres sicher und das zweite ist immerhin in den Bereich des Möglichen für mich gerückt - und ich würde es mittlerweile auch ausprobieren, wie Du! Beautiful photos,hope you had great time! He Du Schneehase, das sieht ja fantastisch aus. Es muss mega viel Spaß machen. Bin schon mal in einer Gondel gefahren, obwohl ich Höhenangst habe. Danke, liebe Sabine. Es war echt lustig, und Respekt, dass Du trotz Deiner Höhenangst mit der Gondel gefahren bist. OMG, what a a wonderful experience, love so much the landscape you show, for me, that live in the south, they are wonderful views ..... Also love the energic and cozy technic blue equipment super cool rena. It is really a pity that you didn’t participate this event, it would have been so wonderful to have this experience together with you! Thank you Noemi! Love the landscape ,the mountains and the snow..
love everything you re sharing just now! where i live it s sunny and windy, but no rain and no snow, so it s great to see how it looks where you are. Sounds really like the weather is different where you live in comparison to our region. Sehr schöne Bilder. Gaastra finde ich auch klasse und ich habe eine tolle weiße Jacke dabon. Demnächst werde ich auch mal meine Bilder online stellen. Danke. Die Gaastra-Mütze gehört auch zu meinen liebsten, ich finde die Marke wie Du klasse. Freu mich schon auf die Bilder mit Deiner weißen Jacke. What a beautiful and stunning lanscape! I wish i were there like you. You lady looks stylish, active and happy as usual. I love bleu color, the best for you! Awesome place! You look absolutely amazing in that winter view! Have an amazing time there! hello there!! throw over some snow!! love the look! Magnificent views, Rena. I am sure you had a blast. What an amazing event. Happy weekend, darling. Looking good! Love your Sunnies! das klingt wirklich nach einer spannenden und ausgefallenen Unternehmung!Die hätte mir bestimmt auch Spaß gemacht, zumal ich immer schon wissen wollte, wie man Iglus baut. Mit Gondeln habe ich seit meiner frühen Kindheit zu tun, wir waren ja oft Skifahren - ich kann mich an das etwas mulmige, aber auch prickelnde Gefühl erinnern, wenn die Gondel für Sekundenbruchteile im freien Fall zu sein scheint. In meiner Höhenangstphase habe ich immer versucht, mich an dieses Kindheitsgefühl zurückzuerinnern, deshalb konnte ich da trotz allem Gondel fahren. Gerodelt bin ich schon lange nicht mehr - zuletzt vor vielleicht zehn Jahren auf einer Sommerrodelbahn... Fesch (und warm) eingepackt warst du natürlich auch wieder - und so richtig gut gerüstet für diese Unternehmung! Wonderful pictures! I love it! Wünsch Dir von Herzen, dass Deine Wünsche in Erfüllung gehen, kann mir direkt vorstellen, dass Du auch einen Mega-Spaß dabei hättest! Das gilt auch für das Iglu-Bauen! Oh this looks like great fun. Great post. So super cute. Love this post!!! Beautiful snow suit! Nice place to be. Rane what a great experience, i will like to experience this one day, love your winter look. It was really wonderful and I can highly recommend to do the same! WOW Du hast wirklich absolut fantastische Bilder geschaffen!Klasse! Ein Iglu bauen? Echtes Eskimo-Feeling - sehr cool! Die hätte mir bestimmt auch Spaß gemacht! Und ich bin überzeugt davon, dass Dir das auch super viel Spaß gemacht hätte, schade, dass Du nicht dabei warst.